Figure 3 Anatomical cross-section of the human eye. "Intraocular Dosage Forms." For orientation, readers are encouraged to familiarize themselves with the anatomical structures of the eye (Table 1), some of which are shown in Figure 3. The eye is essentially a globe suspended in the ocular orbit, specialized for sight through an arrangement of multiple tissues that function to focus, transmit, and detect incoming light. There is a central path that light travels to the retina with all intervening tissues (cornea, aqueous humor, pupil, lens, and vitreous humor) being transparent. All surrounding tissues serve to nourish, support, and protect these essential structures. The cornea composes only one-sixth of the outer surface of the eye, yet is the first and one of the most important barriers to external materials. The cornea is composed of three layers of tissue of varying structural and chemical properties. The presence and type of intercellular junctions regulate molecular diffusion around the cells, while the hydrophilic or lipophilic characteristic of each layer controls diffusion across and along the cell membrane. The cornea itself has no blood vessels, so it relies on passive diffusion of nutrients from surrounding tissues and aqueous humor. The outermost layer, the epithelium, is composed of five to seven layers of stratified epithelial cells that make up only 10% (50 |im) of the total corneal thickness. 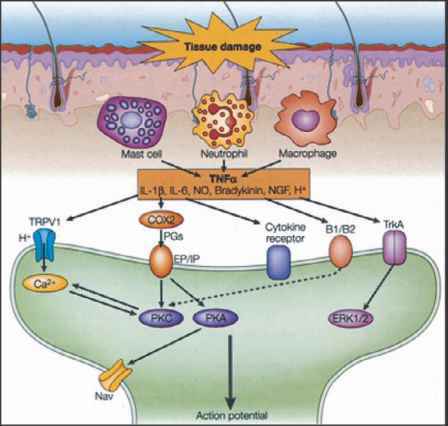 Basal cells of the epithelium are mitotically active to replace the outer cells lost through normal sloughing or injury. The tight junctions and lipophilic composition of the epithelium combine to form an effective barrier to molecules and foreign substances that are hydrophilic or of high molecular weight. The tears, composed of mucin, aqueous and lipid phases, serve to hydrate the epithelium, prevent adhesion of bacteria and other foreign materials, and influence the distribution and toxicity of foreign materials (14). Finally, the epithelium is metabolically highly active, which is protective against toxic substances but may also significantly affect drug bioavailability and therapeutic index. Bowman's membrane separates the epithelium from the stroma, the layer that comprises 90% of the cornea. In contrast to the epithelium, the stroma is 76% to 80% water and composed mostly of collagen fibrils in a highly organized array with interstices filled with glucosamino-glycan ground substance and a scattering of keratocytes. No junctions are present, yet the hydrophilic composition presents a significant barrier to lipophilic molecules. The stroma is susceptible to swelling, and water content must be actively controlled to prevent opacification. This is a primary function of the endothelium, a single layer of hexagonally arranged cells separated from the stroma by Decemet's membrane. Endothelial cells have discontinuous tight junctions to permit diffusion of essential nutrients into the cornea from the adjacent aqueous humor. Cellular ion pumps maintain proper hydration by active transport of ions back into the aqueous humor, drawing excess water out through passive diffusion along the ionic gradient. These "leaky" junctions present little or no barrier to drug penetration, but the overall lipophilic nature of the endothelium limits diffusion of hydrophilic molecules. The human endothelium has a fixed number of cells that are not mitotically active and compensates for cell loss only through migration and hypertrophy of remaining cells. Inability to compensate for cell loss will result in loss of function and corneal opacification; any ophthalmic preparation that could contact these cells must be carefully evaluated for biocompatibility. The cornea is connected at the limbus to the opaque sclera, the tough fibroelastic capsule that encloses the eye and provides support and protection to the interior structures. The visible area of the sclera is generally referred to as the conjunctiva. The stroma has loosely packed collagen fibrils with scattered fibrocytes and few blood vessels, except in the limbal area. No junctional complexes are present, so the sclera presents only a lipophilic barrier to foreign materials. The limbus is rich in blood vessels, and systemic absorption of topically applied drugs occurs here primarily. 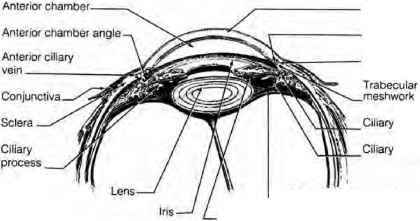 The interior of the eye is divided into three chambers by the iris and the lens. The iris, a ring of muscular tissue that regulates light entry into the back of the eye through the pupil, is located in front of the lens and physically forms the division between the anterior chamber and the posterior chamber. The lens is essentially a flattened sphere that is held in place and connected by fiber-like strands, the zonules of Zinn, to the ciliary body, a tissue that controls lens accommodation. Behind the lens is the vitreous chamber that contains vitreous humor, a transparent gelatinous material that has no turnover and is in direct contact with the retina. The iris, lens, and adjoining tissues serve to regulate light entry, focus light on the retina, regulate the turnover of aqueous humor within the eye, and provide structural support. At the junction of the iris and sclera, the trabecular meshwork and canal of Schlemm drain aqueous humor from the anterior chamber to prevent fluid accumulation, increased IOP, and glaucoma. The aqueous humor itself is produced by the anterior portion of the ciliary body and circulates through the posterior chamber through the pupil to the anterior chamber for a continual turnover of fluid. The iris itself can be affected by mydriatic or miotic agents that control the pupillary opening. The avascular lens has a single layer of epithelial cells on the anterior surface and is surrounded by a thin but tough capsule that conveniently provides the support for an intraocular lens (IOL) once a cataractous lens has been removed. The lens epithelial cells have some mitotic activity, and older cells progressively lose their cellular contents and migrate to form concentric layers of crystalline fibers that comprise the bulk of the lens. The lens is flexible and changes shape to adjust focal length for near objects (accommodation), an ability that is lost with age. Since there is little exchange of materials in the lens and no loss of cells, drug accumulation should be investigated for ophthalmic preparations that are absorbed into the eye. Lining the back of the eye is the retina, a bilayered highly metabolically active tissue that transforms light to an electrical signal that is processed and transmitted as electronic images to the brain. The retina is isolated from the systemic circulation by the blood-retinal barrier, a combination of endothelial cell tight junctions lining the retinal blood vessels and tight junctions between the retinal pigmented epithelium (RPE) cells that restricts diffusion. A complex arrangement of photoreceptor cells (rods and cones) overlies the RPE. The retina connects to the optic nerve at the optic disk, a highly vascularized area that is susceptible to ocular hypertension and drug effects. The choroid is a highly vascularized collagenous tissue lying between the retina and the sclera from the ciliary body to the optic nerve. Finally, several accessory tissues (adnexa) are essential to proper functioning of the eye. Tenon's capsule, a thin membrane surrounding the sclera, separates the eye from the surrounding socket for freedom of movement. The lacrimal and meibomian glands provide essential tear and lipid components while the eyelids assist in tear distribution and protect against mechanical injury. From this discussion, the reader can appreciate the intricacy of the eye and the care required in devising ophthalmic preparations to provide safe and effective therapy.